When you are a new parent, a seemingly mundane activity such as going for grocery shopping can seem like climbing Mount Everest, isn't it? Whether you are looking up to it or not, there will come a time when you will have to take your baby with you to the supermarket. If you think that you will have your baby sit in the so-called shopping 'cart seat,' I have got something to tell you. I still remember the first time I took my (then infant) daughter grocery shopping. 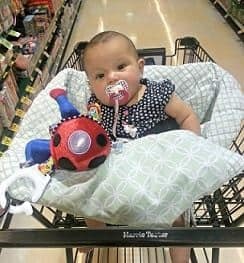 She was about six months old and could sit on her own, I thought of propping her in the 'cart seat,' but realized something…That metal cage is no place for my precious baby to be in, it is unacceptable. Not to mention, the shopping carts are one of the grossest things in a grocery store. They are handled by god knows how many people and they are a breeding ground for germs. Trust me you don't want your baby to sit in those horrible 'cart seats' without a suitable protection. That's where shopping cart covers come into play. I am sure you must have seen other parents using them in the stores. If not, let me first tell you something about this must-have product. A baby shopping cart cover is a cushioned cover that you can put over the cart seat compartment of the shopping cart. As these covers are cushioned, they provide a comfortable seating arrangement for your baby while you are picking out your groceries. These covers also act as a barrier between the baby and the surface of the shopping cart as well. Trust me; a good quality shopping cart cover will change the way you shop with your baby forever! Your baby will be comfortable and safe from the filthy surface of the cart and still with you the whole time! Today, we are going to talk about how to find the best baby shopping cart covers and also review the top 5 best baby shopping cart covers that you can buy today. So, let's get the ball rolling, shall we? How safe is the cover? Is the cover easy to clean? One of my personal favorites, the Lumiere shopping cart cover is one of the best on the market. The cover is made from a high-quality polyester material and is very comfortable. One of the best features of the cover is that it comes with Velcro straps that ensure that the cover fits around the leg openings of the shopping cart. With this cover on, your baby will be completely protected from the rusty metal of the cart. A feature that sets the Lumiere apart is the unique "roll-in" pouch. While most of the covers require you to fold them before storing them in a pouch, the Lumiere is designed to be just rolled into the attached pouch. Let me tell you; this is way easier compared to folding the cover and putting it in the tote bag. I just love this cover and have no issues recommending it whatsoever. If you are looking for a super-comfortable shopping cart cover for your baby, look no further. The Summer Infant is hands down, one of the most comfortable covers in the market. Not only is the cover quite thickly padded, but it also comes with a detachable cushioned seat positioner as well. The star attraction in this cover is the detachable cushion. The cushion or the 'seat positioner' as the company calls it, is designed to keep your baby seated in the right posture. It offers a full body support for your infant and hence is quite cozy and comfortable. The cover can easily transform into a high-seat cover as well. It offers excellent protection against germs with its Velcro fasteners that seal the entire metal surface of the cart. If you are willing to shell out a few more dollars, you can also buy some accessories to transform this shopping cart cover into a travel bed or even a diaper changing station. 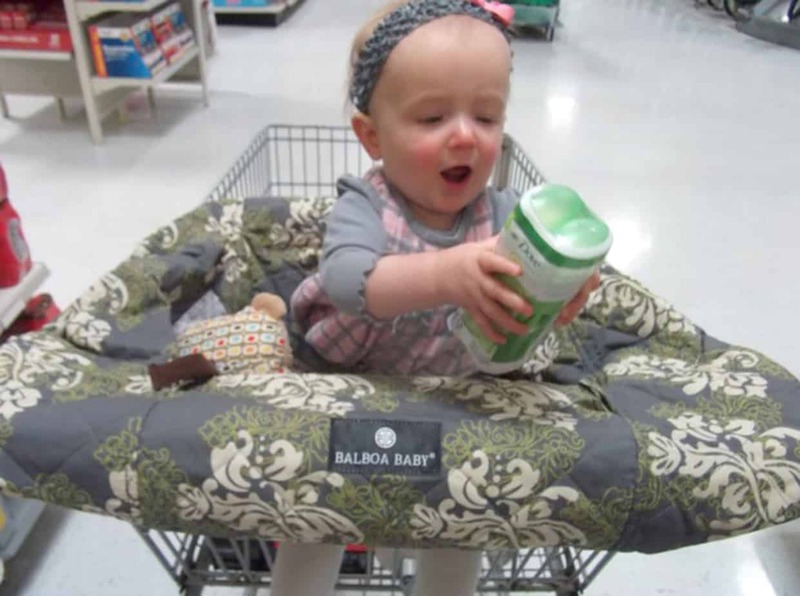 It features a stretchable design that can cover the seat, the backrest as well as the handle of the shopping cart.The cover also has loops for toys and a strap for holding a sippy cup and some snacks as well. You can have a snack box secured to one of these straps and feed the baby as you stroll around the supermarket. As far as the safety is concerned, the Infantino has a harness that securely holds your baby in place. The cover folds up neatly into a tote and can also fit a high-chair if you are going out for dinner in a restaurant. As the cover is large enough to cover the entire high-chair, you don't have to worry about your baby running his/her fingers on the chair and putting them in his/her mouth. The infantino is machine washable and dries quickly as well. The cover is made from 100% polyester fiber that is resistant to stains. Overall, it is a great product that is surprisingly affordable as well. As the name suggests, the Crocnfrog is a 2-in-1 shopping cart cover that can be sued in high-chairs as well. It is a very well-made cover with a lot of padding for the baby. The cover is made from a 100% synthetic polyester that is stain resistant and is easy to machine wash and quick to dry. The outer fabric of the cover is quite silky to touch and is quite comfortable as well. It can be folded easily into a tote bag that weighs less than a pound. The Crocnfrog can cover the back, the sides and the seat of any regular shopping cart without a problem. The inside of the cover has three loops as well to hold toys or sippy cups. The cover also has an adjustable seatbelt to secure your baby safely. It is a great shopping cart cover, and we have no reservations in recommending it. The Heather and Heath grocery shopping cart cover are one of the best-looking covers on the market. It is designed with the 'premium' user in mind and hence it is a bit flashy and more expensive. That said, it is one of the most premium seat covers out there. The cover is equipped with removable pillows and extra thick padding to make your baby feel all snuggly and cozy. The outer fabric is made from high-thread-count cotton for extra comfort. The cover also features secure straps that are quite comfortable for the baby. The harness system is also quite heavily padded as well and therefore is quite comfortable. The cover is quite easy to set up and secures with a series of clips and Velcro straps to the cart. Although the cover is a bit more expensive, it is worth the extra money in my opinion. Need a bit more convincing? Well, if you still need a bit more convincing to be on board the shopping cart cover train, I do have a couple more arguments up my sleeve! According to a news report published on the NBC news website, about 50% of the shopping carts in the US have E. coli on them! Yes, that's correct, 50%! I will just let that sink in…Knowing this, would you ever want to put your precious baby in any one of them? That's right, absolutely not. The shopping cart covers can take care of this problem. The covers act as a physical barrier between your baby and the cart surface and can protect your baby from the germs. Once you reach home, you can throw these covers in the washer and get them clean for the next use. It is as simple as that! Sure, you can say that you wipe down the cart with a sanitizing wipe, but the cover is the ultimate barrier. I prefer to wipe down the cart and then use the cover to be safe. As with most of the things that you buy for your baby, a shopping cart cover needs to be selected carefully. While there are a lot of options out there, some covers are just not good enough to deserve your time and money. Here are some things that you should see in a good shopping cart cover. One of the most important things to look for in a shopping cart cover is the comfort level. You want a cover that will have enough cushioning that will make your baby comfortable for the entire duration of your shopping trip. 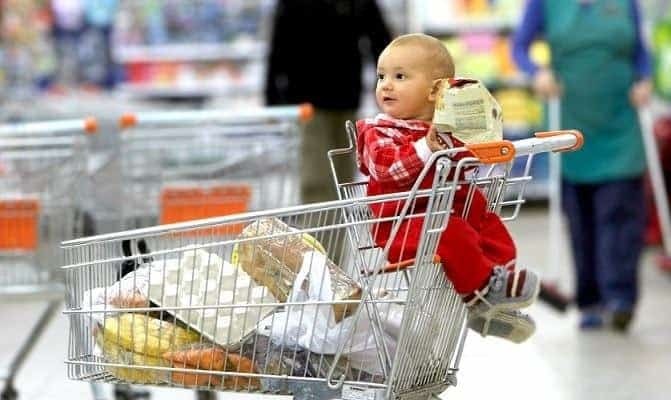 If the baby feels snug and comfortable, he/she will not mind sitting in the cart while you pass through the same isle a 10th time! As a rule of thumb, the thicker the padding, the better the comfort level. Safety is our number one priority right alongside the comfort. The cover needs to have enough straps to secure your baby so that they don't risk falling out. You don't want your baby to stand or lean over dangerously out of the cart cover at any point. If you have bought a car seat, you know what I am talking about here. A shopping cart cover needs to be washed on a regular basis. I usually do it at least once a week. So, if you are planning to wash the cover this often, you need the cover to be machine washable and quick to dry. I would suggest you stay away from thick suede-type fabric that is cumbersome and difficult to wash and takes a heck of a time to dry. There are some covers available that can be cleaned by wiping them with a disinfectant wipe as well. If you prefer not tossing the cover in your washer, these may be perfect for you. Another thing to keep in mind is the fact that your baby might make a mess on the cover and hence the go for a cover that will not stain quite easily. Durability is obviously one of the most important things when it comes to a shopping cart cover. You are going to end up using this cover for quite some time, and if it falls apart after a few days, it is not good news, is it? Look for covers that are made from a high quality material that will withstand heavy use and also repeated washings. Cost is also a crucial factor to consider. You don't want to spend hundreds of dollars on a shopping cart cover that you are going to use twice or thrice a week. I would suggest you keep the cost below a $50 to get the most bang for your buck. 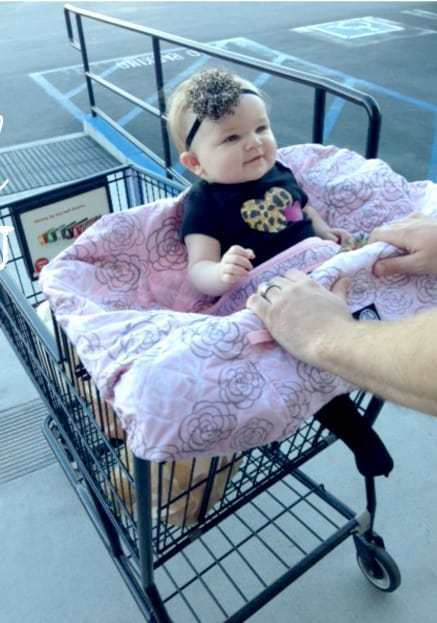 Shopping cart covers can completely change the way you do shopping with your baby. They are a must-have accessory, and after testing tens of covers, the ﻿﻿Lumiere ﻿﻿Shopping Cart Cover receives our strongest endorsement. It is one of the best value-for-money shopping carts covers out there. The Lumiere is very comfortable, secure, safe and most of all, very easy to use. It can be rolled up neatly when you are done shopping and occupies a small space. Although all the options that we reviewed here have a lot of great features, the Lumiere edges them all; albeit by a slight margin! If you liked what you read, help us spread the word and share this post with your friends and family.